Perusing the August 2017 issue, I turn to page 90 and there was the bike that makes this old heart jump. A 1959 Greeves Scottish. After watching works rider Jackie Simpson practising on his bike, with an alloy barrel with detachable transfer ports no less, I lusted for one. I traded in my faithful, heavy 350cc 1953 rigid Matchless trials for a sparkling new Scottish 200 from John Surtees’ store for the princely sum of £200. Moorland blue with a light blue petrol tank, so light and smooth, but it went down the road like a crab! Quick ride over to Essex to the works where the rear wheel was rapidly changed and all was well. I have ridden a lot of trials bikes – Cubs, Sherpas, even Gordon Jackson’s 187BLF, but the memories of that bike, so smooth and flexible makes me want one, your first love is indelible in the mind. Thought you might like to see a photograph of my living room furniture. Brian Slark, USA, via email. 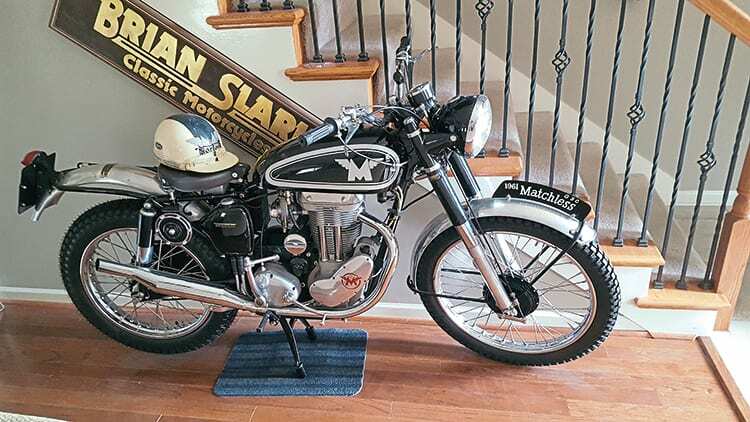 Brian Slark’s lovely Matchless trials iron, resident in the house.